It's almost the end of tomato season. Same goes for tomatillos, their small green cousin. I've always admired tomatillos at the market, picking them up and feeling their papery covering. Sometime in late July I finally bought some, unsure of what I would do with them. Over several sessions of experimenting, I've figured out a couple of delicious things to do with tomatillos. I thought I'd share with you, as they're probably in your market too for the next two weeks and it's easy to make interesting and delicious food with tomatillos, as it turns out. Start by peeling off the paper outer shell and wash each tomatillo. Cut them in half and broil them until they brown a little, maybe 8 minutes. Let them cool, and then puree them with the juice of one lime, a clove of garlic, a little sugar, and a bit of salt. I like to add at least one jalapeño pepper. Two or more is delicious but the kids have a hard time if I add more than one. So now you have this delicious tomatillo purée. You can stop here, grab a bunch of tortilla chips, and go to town. And yes, save a little of the salsa to do just that. But this stuff is liquid gold for cooking. I've been braising pork shoulder in tomatillo salsa. Start by browning a hunk of pork shoulder. Then cook some onions and garlic in the same pot, add a solid tablespoon of ground cumin and coriander, a healthy dose of the green tomatillo salsa, some stock, and put the pork back in the pot. Braise at 275 for 3 hours, turning the pork once. You can serve chunks of the pork with the braising liquid and some cilantro over rice, or shred the pork and serve it with either the braising liquid or some of the original salsa in soft tacos. I'm sure there are other things to do with tomatillos, but I haven't figured them out yet. I'll tell you this, though. Green chili braised pork and green chili soup are really good. And you've probably figured out by now that this is beer, not wine food. Who says there's nothing good out there for about $10? There are good wines at that price point but they're harder to find than I can ever remember. What do I mean by "good?" I don't mean just that they taste good and are well balanced wines, although they do and they are. I mean also that they show something of the place where they are from. I drank two very good wines recently that cost me all of $10.80 apiece. Wines that I would recommend to anyone, wines that I would happily drink anytime because they are delicious and expressive of place. It doesn't hurt that both wines match beautifully with a wide array of food. 2007 Michel Brégeon Muscadet Sèvre et Maine Sur Lie, $10.80 (mixed case discount price), Imported by Kermit Lynch Wine Merchant. After reading David Lillie's great Muscadet piece in the Art of Eating I had to drink some Muscadet. We cooked some meaty and sweet triggerfish with a mix of chopped late summer vegetables cooked simply in butter. Edward Schneider of the NYTimes Diner's Journal blog cooked with triggerfish this summer, by the way, from the same market where I bought mine. He didn't love it, but I think my preparation is better than the one he used (come on over and try it if you don't believe me, Ed). I like slipping the fish through flour that has been seasoned liberally with salt and pepper, and then frying over high heat in butter. Triggerfish eat shellfish and their flesh is sweet. The flash frying in butter accents the sweetness of the fish. It might sound silly to quibble over olive oil or butter, but these things are important when you are working with fresh ingredients and cooking simply. Anyway...the Muscadet was a great match for the fish, drinking so much better than it was a year ago. It is more open now, well balanced and stony, good substance on the mid palate, and the finish fragrant with citrus and the smallest hint of fennel. This is absolutely lovely wine for the same low price as most crappy Malbec. 2009 Marcel Lapierre Vin de Pays de Gaules Raisins Gaulois, $10.80 (mixed-case discount price), imported by Kermit Lynch Wine Merchant. This is Marcel Lapierre's simple country wine, and it is utterly delicious. It is also unmistakably Gamay from Beaujolais - you could identify this blindfolded simply by smelling it. Actually, I'm not sure exactly where the grapes were grown, but you can read David McDuff's post for more information. This is 2009, a great vintage in Beaujolais, and this wine offers particularly great quality this year. It likes a little swirl after opening - it is a screwcap closure and a little reductive at first. But it blossoms quickly and shows lovely ripe and spicy fruit and that enticing sweetly snappy acidity that invites - no, requires further drinking. Regional Beaujolais from good producers used to cost about $14 a few years ago. Now it's closer to $18. This Lapierre wine is of similar quality and costs less (in NYC, sorry Philly). If you see this wine you should buy it. My friend Dan Melia came for dinner the other night. We ate and drank well - Sherry while finishing up the cooking and a great Bandol rosé with broiled Spanish Mackerel. But the most memorable thing we drank, for me, was Weissbier. Several different Weissbiers, in fact. I won't try to create a story here where there really isn't one. I don't know anything about beer, never mind Weissbier. I know that I've had bad sweet Weissbier (often served with that odd wedge of lemon), and I've had good versions. The good ones are fruity but they also are complex and bitter and well balanced. What is Weissbier? It is a German term for beer that is made using wheat, either instead of or in large proportion along with barley. In Germany Weissbier is unfiltered, unless it is called "kristallweizen," which means clear wheat - it is filtered. I've seen this kind of beer before but never tried it, and I'm not sure that I understand the appeal. One of the best things about a delicious Weissbier is the funky flavorful yeast that sits on the bottom of the bottle and the cloudy texture that always feels just a bit chewy to me. Filtered wheat beer? That would be like drinking decaf, or cooking with margarine. What kind of crazy person would do such a thing? Anyway...we drank four Weissbiers on that evening. I poured tastes of the first two and Dan, who spends a lot of time in Germany gave me this "you are so pathetic" smile, and relieved me of pouring duty. Here is where I learned some truly important things about Weissbier. You want to make sure that the yeast at the bottom is mixed with the beer and included in the glass. No delicate pouring like I was doing. Dan dumped the beer into our glasses, stopping to swirl the yeast when the bottle was nearly empty, and then poured the rest. Dan said that Weissbier is never served on tap in Germany - there would be no way to include the yeast. It's always served in bottle. Hmmm. There's a neighborhood place that I enjoy going to for dinner mostly because I can drink Weihenstefaner on tap. Scratch that place off my list, thanks Dan. Hopf and Schönram Weizens are approximately $8.00 for a bit more than a pint. These are aromatic and bright beers that very well complemented our spicy food (details on the food in a coming post). Both were delicious, although we slightly preferred the spicy complexity of the Schönramer Festweisse. We then sampled two dark Weissbiers. That's right, dark wheat beers, called dunkels. Franziskaner and Weihenstefaner were both less expensive at about $4.00 for a pint-plus, and they also were nowhere near as interesting. They were very good beers, but they lacked the energy and cut of the "regular" Weissbiers. Grain of salt: I drank the Weihenstefaner a week ago without any other beer to compare it to and I loved it, so go figure. It's funny how when I was at Bierkraft browsing for beer, I remember thinking "Wow, $8.00 for just over a pint of beer, that's not cheap." But compared to what you might spend on a bottle of wine of similar quality, it is very inexpensive. 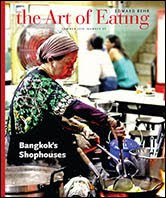 I just got the new Art of Eating, issue number 85. I always enjoy this magazine, Edward Behr's journal in which passionate scholars of food and drink discuss in vivid and personal detail the things that they love. This issue is particularly exciting to me, as it features work by two of NYC's hardest working wine professionals, both of whom I now know at least a little bit. Levi Dalton, my friend and the head sommelier at Alto, in the monthly column entitled "Why This Bottle, Really?" writes about one of his favorite Fianos, the Pietraculpa Fiano di Avellino. In just a couple of paragraphs he provides context for the wine and describes in detail why it is special. Fiano is a wine that I had never heard of until last year at around this time when I went to Convivio for dinner and put myself in Levi's hands, omakase style. With my grilled sardines he served a glass of Fiano (I don't remember which one), but I remember how the smokiness of the wine and its great clarity made my sardines taste impossibly good. David Lillie, one of the owners of Chambers Street Wines, one of the finest wine stores on the planet, writes a full length article called "The Flavor of Stone" about the wines and producers of Muscadet. It immediately, in my opinion, becomes the best place to begin reading and learning about those wines, the people who make them, and the place where they are grown. At the end of the article, David briefly discusses a plan in the works that would change the appellation status of some of the finest wines of the region. 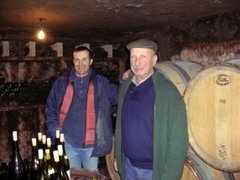 Top producers such as Marc Ollivier, Pierre Lunea-Papin, André-Michel Brégeon, and others are making great wines that showcase specific terroirs within Muscadet, and often involve lees aging for longer periods than are allowed under the appellation rules. Ollivier's Granite de Clisson is a prominent example. Growers are petitioning for Grand Cru status for these wines, and it will be interesting (and quite possibly very frustrating) to see the results as they unfold. For anyone interested in Muscadet, this is an absolute must-read. These great pieces remind me of what it is that separates great wine writing from the more common kind of blogging that I do. In reading these pieces, one learns something of the author and a bit about the way they personally experience the wines, their professional take on the flavors and aromas. But these pieces contain more than just tasting notes, opinions, reminiscences, pairing advice, and other bloggerly type work. There is actual fact in here, fact that frames and perhaps forms the most important part of the stories. One comes away smarter after reading, not simply entertained. Congratulations Levi and David! I hope that you both find ways to continue writing about wine. Oh, and by the way, The World of Fine Wine now hosts a blog and my friend Peter Liem, another of the world's finest wine writers, will be a regular contributor. Anyone familiar with WOFW knows that four times a year it is an incredible work of science and art. It attracts some of the finest and most learned wine writers in the world, and it is a well deserved honor for Peter, already a regular contributor to the quarterly journal, to write for the blog. Summer is officially over, and although I love autumn, I do feel gloomy about it. I love summer, just love it. I love how long the days are, all of the great things to eat at the market, the feeling of sitting on the deck at 9pm bathed in 72 degree warmth. The thing is, summer is actually about to begin again. Think of it this way - it's almost Halloween and then before you know it, it's Thanksgiving. And then it's the end of the year holidays. Okay, there's tough stretch in January-March but then it's spring, and we all know how quickly spring flies by. Then it's summer again. So actually, it's almost next fall. Beat 2 eggs, and whisk them with 2 cups of some combination of milk and or cream. I used a cup of each, and it was almost too rich. Whisk in some salt, a bit of sugar (which you can omit), 3/4 cup of flour, and corn. I used the scraped kernels from 5 cobs. You can use less or more depending on how corny you want your pudding to be. I like a lot of corn in there. Here you can add chopped basil, grated cheddar, whatever else you like. I kept it plain with the little daughters in mind, and added only a half stick of melted butter, spread the mixture in a pan and bake at 350 for an hour and a half or until the top is golden brown. That's it, that's the dish. There are many things that would be great to drink with this. Please, you be the sommelier. What would you open with this corn pudding? Cellar space is at a premium in NYC. I can't save all of the different wines I would like to age. There are many different wines in my "cellar" (read: wine fridge), things that most anyone would agree should be left alone for years before drinking. It's the little wines that I never seem to make room for, and we drink them up when they're young. There's nothing at all wrong with that - if a wine is expressive and delicious young, why not drink it? Some humble little wines, though, can improve dramatically with even short-term cellaring, and I wish that I had more space/self control to give them that extra year or two in the bottle. A couple examples. I never manage to hold any Coudert Fleurie. The old vines Cuvée Tardive I'm good about, but the regular wine...as much as I'd like to sock a few bottles away, the wine is always delicious young, and so we drink it. 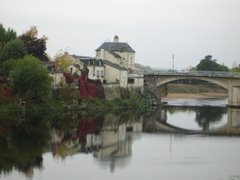 Another example - all Bandol rosés. As committed as I am to holding a bottle or two, I seem to find excuses to open them. This is all too common with me. There are so many wines that I'd love to put away, but don't. Such is life - there are choices to make and one cannot cellar every interesting bottle of wine. I drank a few things recently that reminded me of the rewards of storing the humble wines even for just a year or two. 2006 Bernard Baudry Chinon Cuvée Domaine, $18, Louis/Dressner Selections. I've always enjoyed this wine but I never managed to store any until the 2006 vintage. It's just so good, even right out of the gates. Some folk, like the Vulgar Little Monkey, figured out long ago that there are several Baudry wines worth cellaring, the humble Cuvée Domaine included. It's not Baudry's top wine and it will never be earth shattering, but Cuvée Domaine is a great wine that in most vintages is even better with a few years in the cellar. The tannins have rounded a bit in the 2006 and the wine flows freely across the palate. The fruit is rich and the body lean and muscular, the sensibilities of gravel and flower coexisting harmoniously. You will be proud of me when I tell you that I still have another bottle of this. And a few of the 2007's too. I need an underground cave. 2006 Jacques Puffeney Arbois Trousseau Cuvée les Bérangères, $30, Imported by Neal Rosenthal Wine Merchant. Again, this was always an attractive wine. But I managed to hold this last bottle for merely one year and the payoff was huge. The slight astringency that I was always happy to work with is gone now, and so is whatever else that is not essential to the purest of cool red currant and leafy raspberry, the gamy undercurrent, and the stony finish. So agile and energetic, such a compelling example of cool climate mountain wine from the Jura. I hereby renew my commitment to the 2007's. 2007 Domaine de Terrebrune Bandol Rosé, $25, Kermit Lynch Imports. I won't lie to you - I didn't cellar this wine. I drank all mine last summer and loved all of it. But Chambers Street came across a small bit recently and I bought a bottle from them. Wow - the wine is even better. It takes a while to open up, but when it does it really sings. Peach juice, spices, metal, and stone, pure as can be and perfectly balanced. The gamy streak that was there in its youth was not here a year later, but I loved how there is a new dimension to the texture. There are layers on the palate now, and there is a tactile sense to each flavor. I bet that this is just the beginning for this wine, actually. Bert Celce of Wine Terroirs has written about the aging potential of Bandol rosé, Terrebrune's in particular. I hate traveling for work because it means being away from the wife and kids, but New Orleans is really fun, I must admit. This week I spent another few days there and I ate some tremendously delicious things. Fried Boudin Balls at Boucherie. These were better than any others I've had, including those I had during my recent visit at the otherwise fantastic Cochon. They were great with the 2009 Ameztoi Txakoli which was only $33 for the bottle. Chicory coffee and beignets at Cafe du Monde. I understand now why people wait on long lines. Herbsaint was again fantastic. Instead of wine, I drank their Sazerac, which is perfectly balanced and delicious, and very aromatic. 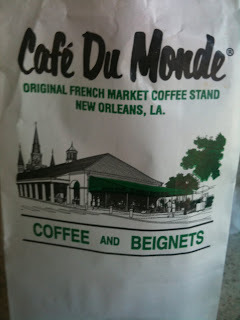 It was nice with their chicken and Andouille gumbo. The jumbo gulf shrimp were just excellent too. In the high-end category, this is a don't-miss place if you visit New Orleans. I saved the best for last. I ate two of what honestly were the very best sandwiches that I have ever eaten, anywhere. Yes, I've had wonderful Banh Mi, and other great sandwiches, but these both hold their own against anything that's out there. The Muffuletta is a tricky thing, but Mahoney's Po'Boy Shop does it right. The bread is thick but pliant and there is a perfect amount of cured meat and cheese. But it's the lovely variety of pickled vegetables that steal the show. They are perfectly done and plentiful and they remind me of the pickled daikon and carrot strips in a Banh Mi sandwich - they provide acid and texture and balance the richness of the meat. Mahoney's was so good that I went back and had a different sandwich. 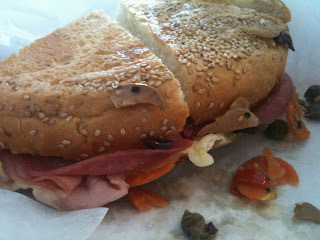 Would you believe me if I told you that it was even better than the Muffuletta? 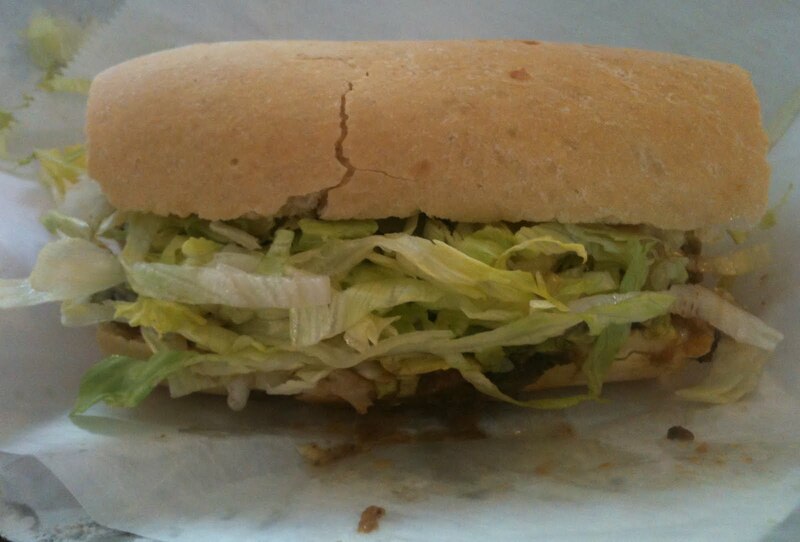 Roast beef n' gravy is a traditional New Orleans po'boy and it was ridiculous. The beef was more braised than roasted, it seemed to me, and it was tender and just a bit chewy, well seasoned, and with the dressing of lettuce and a light gravy, it was simply delicious. Possible-to-eat-a-couple-times-a-week delicious. 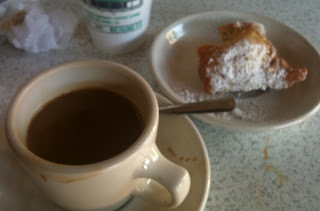 I haven't yet tried the fried oyster po'boy, or soft shell crab po'boy being eaten by the wise old gentleman sitting next to me. I considered grabbing his and fleeing the shop, but then I remembered that I have to visit New Orleans again for work and I'll go back to Mahoney's. I ate a plate of beef tongue recently at Tsukushi, a small Japanese restaurant in midtown. It was part of long lineup of dishes that the chef served to us, and it was one of the best things I've eaten in recent memory. The meat was sliced into very thin, perfectly round circles, and served warm on a bed of fresh greens. It was moist, as if it had been swirled in its cooking juices right before serving. 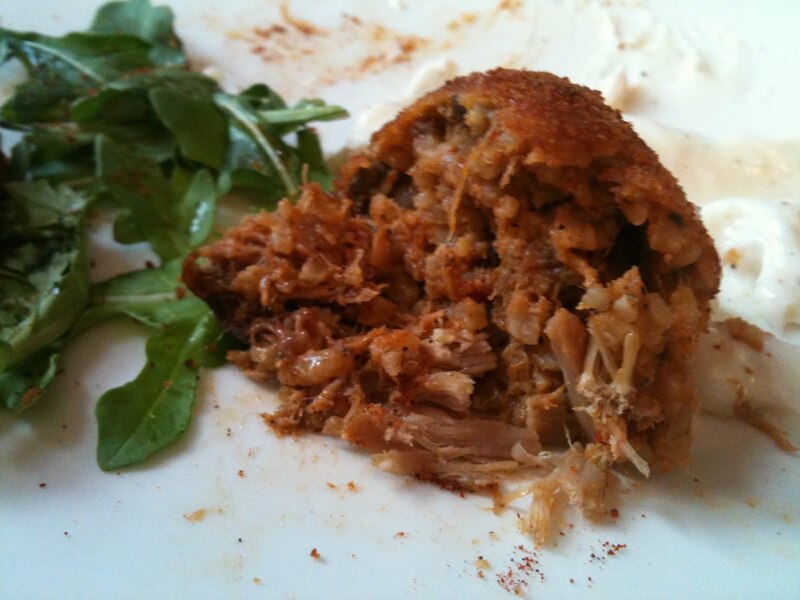 The taste was definitely beefy but in a gentle way, and the texture was a miracle of melt-in-your-mouth silkiness. So when I saw a Slope Farms beef tongue the following week at the Food Coop, I had to try making this at home. And by the way, it's not easy to find a Slope Farms beef tongue. Slope Farms sells only the whole animal - no parts, so the Coop gets one tongue every week or two. There are 13,000 members of the Coop, and all of them are always on the lookout for the tongue. Okay, even if it's only 10% of them, that's over 100 people I'm jockeying with. Let's not tell each other lies. Tongue, before it's cooked, is simply is not terribly appetizing to look at. I have absolutely no idea how to make tongue, but one must try new things in the kitchen from time to time, mustn't one? I figured I'd boil and simmer it, take the outer membrane off, cool it so it would slice easily, and then re-heat it by swirling it in its own reduced and hot cooking liquid. I used about 1 part soy sauce, 1 part chicken stock (didn't have beef stock), a half part sherry vinegar, and 2 parts water for the cooking liquid. I seasoned the liquid with a crushed clove of garlic, a sliced medium onion, a thickly chopped stalk of celery, a star anise pod, 6 black peppercorns, and a large bay leaf. Brought it to a boil and then simmered for three hours. Once it was cool enough to handle, I removed the white outer membrane, wrapped the tongue tightly in plastic, and tucked in the fridge overnight. The next evening I reduced some of the strained and skimmed cooking liquid, seasoned with salt and a bit more sherry vinegar, and swirled some thin slices of tongue. Tossed some fresh lettuces in the same cooking liquid, and finished with a few drops of sesame oil and a bit more salt. My version of this dish tasted fine, the seasoning was good and the meat pleasantly beefy. But this was nothing that would inspire anyone to run out and look for tongue to make in their own home. How did the Tsukushi chef get his slices to be so perfectly round, and the texture so incredibly silky? There is no higher quality beef out there, so the issue is technique, not ingredients. Some of you know how to cook tongue - so tell me, what went wrong with my tongue? My pal Deetrane showed up at our poker game the other night with a bottle of Armagnac and an interesting story. Many years ago his grandmother was given a bottle of Armagnac. This was in the late 1950's, early 1960's - Deetrane will correct me if my dates are wrong. She put the bottle in the closet and forgot about it. Recently she dug it out and gave it to Deetrane. Many people would think about the perfect time to open the bottle and who to drink it with, and that's fine - that's probably what I would have done. But Deetrane's impulse is always to share, and with many people. So he brought the bottle to our poker game. He had already opened it, but there was plenty of 40-50 year old Armagnac in there when he came by, let me assure you. The label reads "Ch de Malliac," and under that it reads "Hors d'age 12-5617." And to the upper left of the 12 there is a circular symbol like the one used to indicate degrees when writing the temperature. My guess is that this brandy was made in 1956. Perhaps the 12 refers to the barrel number? I really don't know. Chateau de Malliac is a well established Armagnac producer, but I couldn't find any information on old bottles when poking around the web. 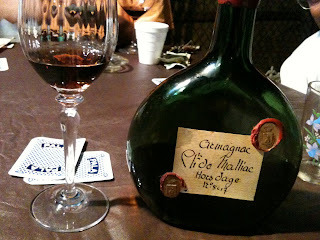 Deetrane's grandma's Armagnac was fascinating. If it were a person, it would be a handsome logger who lives in the forest, and who cleaned up and shaved for dinner. The alcohol was quite prominent on the nose, and it wasn't easy to get a clean read on other aromas. Overall, it reminded me a bit of an Oloroso Sherry - walnuts, very complex. Dark and earthy on the palate with rich tones of burnt orange peel and coffee. And I was surprised to find some fruit too - something fleshy that made itself felt here and there. What is really old Armagnac supposed to taste like? I really like Armagnac - from what I've tasted, I prefer it to Cognac. But I've never had an old Armagnac and I have no context whatsoever for tasting. 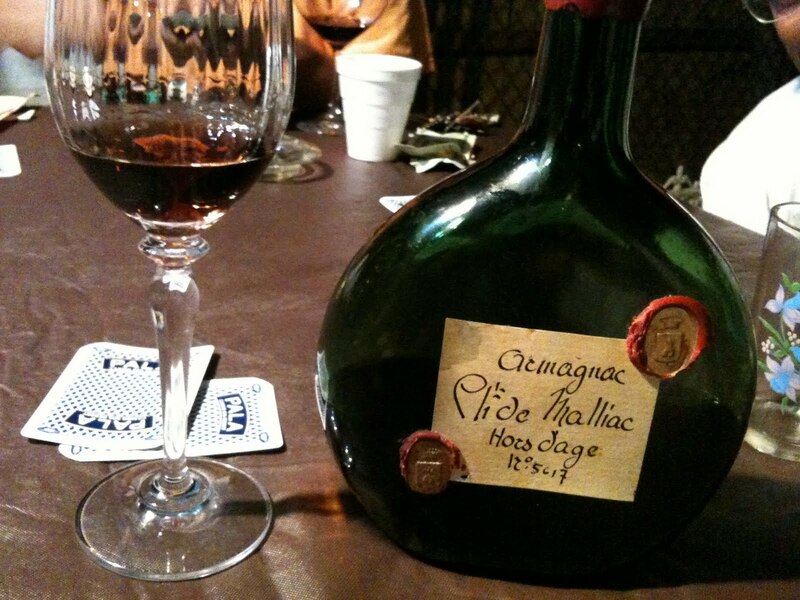 If you've had old Armagnac before, what did you find? I hung out with Peter Liem for a lot of the past two weeks. It's weird - when I spend time with Peter I find that I drink a lot of Champagne. Here are the amazing Champagnes I drank in the past few weeks, along with a few notes, and I will tell you now that with the exception of the Larmandier-Bernier and the 2000 Tarlant, I drank these wines solely because of the generosity of others. 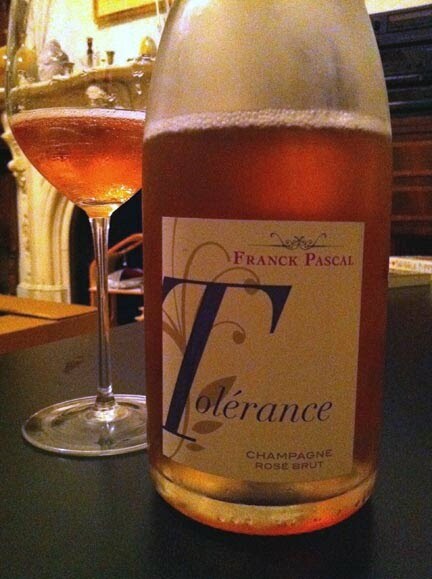 NV Franck Pascal Cuvée Tolérance Brut Rosé, price unknown, no longer imported (JD Headrick was the importer until recently, as I understand it). As reported in ChampagneGuide.net, Franck Pascal is a rising star in the northern part of the Marne, in the village of Baslieux-sur-Châtillon where the soil is especially friendly to Pinot Meunier. This rosé is mainly Meunier, based on the regular NV cuvée with still red wine (both Pinot Noir and Meunier) blended in. I loved this rosé. 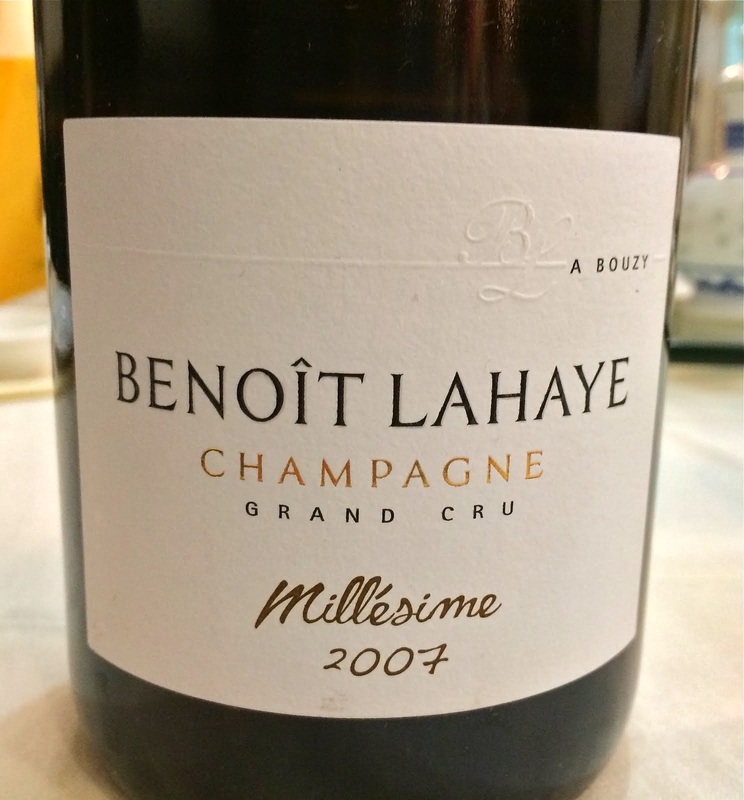 Fresh and bright with fruit, and it really showed what to my taste is typical of Meunier - a round and fleshy, very broad character with something sweet and nutty like marzipan or cashew under the fruit. And despite all of that, the wine retained a classy sense of control and finesse. Very impressive, very delicious, I hope not too expensive when it makes it back to the States so I can buy some. 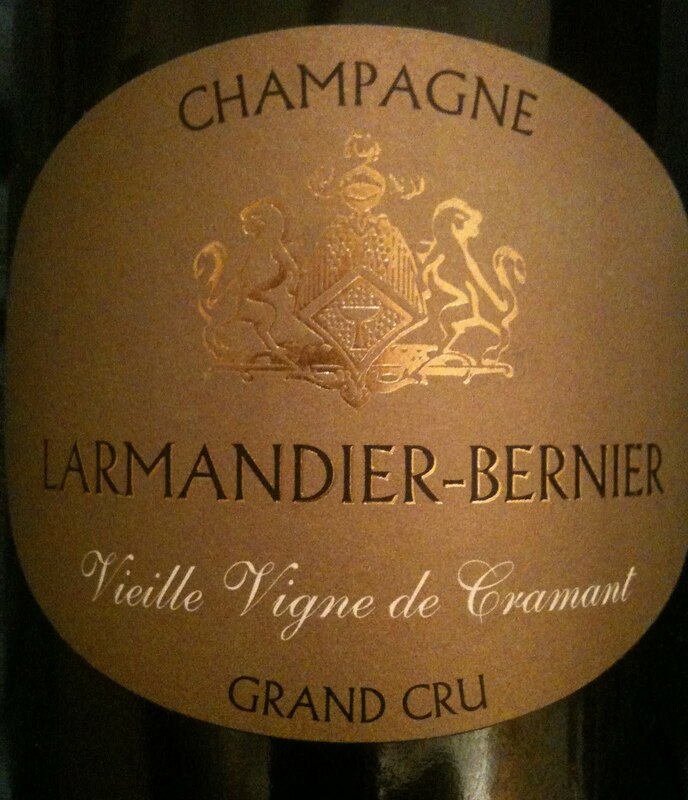 (2002) Larmandier-Bernier Vieille Vignes de Cramant Extra Brut Blanc de Blancs, $70, Louis/Dressner Selections. Some say that this wine does not benefit from long aging. I'm glad that I saved this for at least a few years (2005 is the current vintage), as it seems to be in a particularly sweet spot right now. Laser-like focus, delicate aromas and flavors but with great intensity. Much more about salt and rock than about fruit, and the chalky finish is graceful as it stains the palate and goes on forever. To me, a truly great Champagne. NV Jacques Selosse Champagne VO, about $165, Imported by the Rare Wine Company. This particular bottle actually was purchased in France and traveled here by suitcase. I've had this wine once before and the two bottles were quite different. This one was probably a blend of wines from 2003, 2002, and 2001, and was aged on the lees for five years. It showed less of the oxidative character that has (quite beautifully) run through the few Selosse wines I've drunk. This one was lithe and stony, with bright and ultra-clean lemon fruit. Three of us drank this bottle and I don't know about you, but it's hard to go slow with Selosse. We may have sucked it down right as it was ready to fully show itself. My good pal Adam recently opened a bottle of the '99 and it was utterly gorgeous. The essence of the wine is this sandy brown mineral tone that permeates everything else. There is some fruit, but it is part of the supporting cast. Such intensity and focus, such wonderful balance. What I remember best about this wine is the way it unfolded in the nose and mouth - layers of aromas and texture, always crystalline and pure. Peter and I drank the 2000 two weeks later and I was struck by how similar the wines are. The 2000 is a bigger and richer wine, but that warm sandy brown mineral tone still suffuses everything. The flesh of the wine tastes like marzipan here, and it shows remarkable grace and class for a big wine. La Vigne d'Antan has become one of my favorite Blanc de Blancs. 2004 Louis Roederer Brut Blanc de Blancs, $60, imported by Maisons Marques & Domaines USA. Okay, stop right there if you're thinking "Wait, Roederer? Isn't that the huge négoce wine that Jay-Z likes?" Well, yes and no. Roederer does buy a lot of grapes, but only for their basic non-vintage Brut. All of the grapes used to make the other wines are estate grown. This is a wine of delicate subtlety and great finesse. There are no fireworks, there is no flash. There is chalk infused lemon fruit and a remarkably fine texture - that's what stayed with me, the pillow-y texture. 2002 Louis Roederer Champagne Cristal Brut Rosé, about $575, imported by Maisons Marques & Domaines USA. The first thing that struck me is the continuity in style between this and the above wine - we drank them on the same night. Both wines are honestly marvels of texture, well structured but cloud-like. It is hard for me to describe a wine like this, but I will say that it was as close to perfect as any wine I've had. How can so much intensity, detail, and raw material be packed into such a refined and elegant package? 2000 Dom Pérignon Brut Rosé, about $320, Imported by Moët Hennessy USA. Richness and density, but still elegant and vividly detailed, kind of an amazing thing to have rolling around in the mouth. Hard to describe this one too - just an amazing wine. Funny how this and Cristal seem to both have sacrificed their credibility among wine aficionados by allowing their brand to be portrayed as the ultimate in over-the-top luxury wines. They are stratospherically priced and out of reach of most of us. But if these bottles are representative, and I was assured that they are, they are finely crafted and exquisite wines, among the very best Champagnes. In the past week I had the opportunity to drink several Amontillado Sherries. That's because I've been hanging out with Peter Liem and he likes to drink Sherry a lot. I know essentially nothing about these wines - everything that I'm going to tell you from here on is me paraphrasing some of the things he said during several conversations. I enjoy Sherry and I drink more of it than ever before, but I've pretty much limited myself to Fino, Manzanilla, and the occasional Fino de Puerto - Sherries that are aged under flor for something like 5 to 8 years and then wine is drawn from the solera and bottled. Amontillado Sherries begin as these same wines, but they continue to age after the flor dies - flor lives for about 8 years and then it kind of expires. As there is no longer a protective flor coating, the wine continues to oxidize, taking on a lovely dark color and a new set of aromas and flavors. One interesting way I've been learning to think about Amontillado is to consider where it might be on the flor - Amontillado continuum. Peter said that it is, in fact, a continuum. It's not as if there is some exact day upon which a Fino becomes an Amontillado. Amontillado can show more or less flor character depending on the wine maker's choices. Lustau Almacenista Amontillado Sherry Matured by Jose Luis Gonzales Obregon, price unknown but I think around $35, Christopher Cannan Selections, Michael Skurnik Imports. We had this by the glass at Terroir TriBeCa and it was simply excellent. Obregon makes both this wine and a Fino del Puerto that goes into Lustau bottles and at this point I will buy and drink wither of them at any chance I get. I found this wine to be just as graceful and elegant as the Tio Diego, but richer and darker, further away from flor on the continuum. I must have it again, and someday I want to drink it next to Tio Diego to better understand the differences between the two wines. Gutierrez Colosía Amontillado, $32, Bon Vivant Imports. This is a very fine wine that is further still away from flor than the Gonzaled Obregon Amontillado. And still, it shows great freshness, clarity, and focus. A great example of how a wine can be very rich and with all of the deeply nutty character that one would expect from Amontillado, but can still maintain an elegant lightness in mouth feel and aroma. Delicious wine, highly recommended. Bodegas Tradicion Amontillado, price unknown but I think around $60, Steve Miles Imports. I drank this near the end of a wonderful Sherry dinner put on by Levi Dalton and Dan Melia. I must say that at first, I didn't get the wine - I thought it was all caramel. But maybe that's because drinking small glasses of about 20 Manzanilla and Fino Sherries with dinner can result in mild intoxication. I was lucky/crafty enough to take the bottle home after the dinner and the next day, I found the wine to be staggeringly complex , silky smooth, very rich, and very well balanced. This is made from wines that average 50 years of age! Yes, there is a caramel nuttiness to the wine, but I was getting fresh fruit, like quince and apricot on top, and the texture was really lovely. If I remember correctly, the word that Peter used to describe this wine was "profound," and I would agree. A good friend who called me last night to ask me how I make a Negroni. I told him how I make mine, and in so doing, I thought about how tragic it would be if there are others like him out there - otherwise very intelligent people, worldly people who are great in the kitchen and who have a lot of experience making food and drink, but do not know how to make a Negroni. So please consider this as a public service announcement. Let me start by telling you that I have never been a bartender. I have no piercings, I am not now, nor have I ever worn a bowler hat. Same goes for arm gators - never. I have not yet planted a vegetable farm on my roof, and I have never raised and then butchered a pig. I have, however, seen many western movies in which men wear mutton chops, bowler hats, and arm garters while tending bar, and I hope that the viewing of those films, in conjunction with the tattoo that I got in college 20 years ago, will convey upon me sufficient mixology street cred. The first time I had Negroni it was served to me after dinner in a Martini glass. I loved it immediately - bittersweet, perky, complex, just delicious. I asked how to make it and the bartender said that the owner of the restaurant wants the Negroni to be served as an aperitif over ice, but he prefers it straight up after dinner. His recipe: 3 parts gin, 2 parts sweet vermouth, 1 part Campari. I made mine that way for a while and enjoyed every one of them. That said, the classic recipe for a Negroni is equal parts gin, sweet vermouth, and Campari. Nowadays I use basically equal parts, but I like to use a little bit more gin, say a 3 and a half count pour instead of 3. And these days I prefer a Negroni as an aperitif on the rocks, and I like a thin slice of lemon that I massage with the ice cubes before I pour the drink in the glass. I know, an orange slice is more typical, but I like the bite of the lemon. 3 or 4 ice cubes in a shaker, add the above ingredients, shake vigorously while envisioning a frontier days bartender in Cheyenne. Press a lemon slice between ice cubes, pour the drink, have fun. If you have a favorite Negroni recipe, or know of a good tattoo removal service, please share in the comments.